Every home have a first aid kit, and each pharmacy thermometer. Moreover, despite the dominance of electronics, very often this is a mercury thermometer. Amazing this is nothing, because a traditional mercury thermometers show the most accurate results, do not require replacement batteries and properly serve more than a dozen years. Disadvantage of mercury thermometer, only one - its fragility. 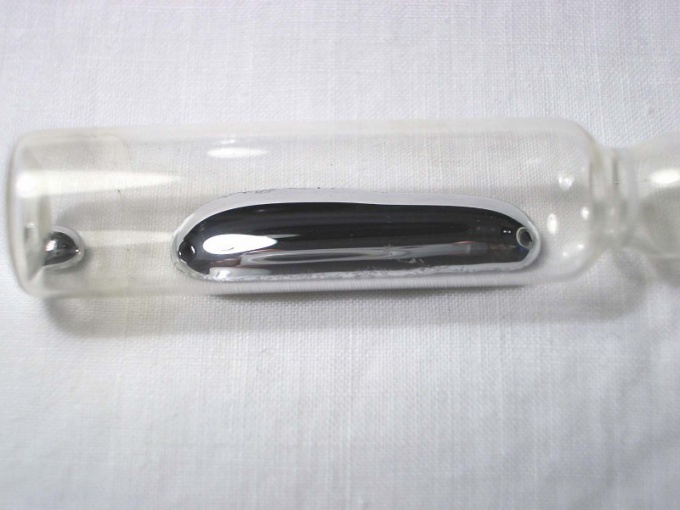 The main working component of traditional thermometer mercury enclosed in a glass transparent tube. Damage it very easily, resulting in possible leakage of mercury. Spilled from a thermometer the mercury is not a threat, but allocated it pairs extremely dangerous. Inhalation of mercury vapor leads to severe poisoning with serious consequences. That is why, even if your old mercury thermometer is not damaged, but just needs to recycle, to throw it away with household waste - is irresponsible and very dangerous. If the thermometer is not damaged, but got corrupted and can no longer be used, dispose of it. The main question faced by responsible citizens who do not wish to throw away mercury thermometer to the nearest ballot box - where should I put the thermometer for disposal. Under current law, to accept thermometers for recycling are required in pharmacies and hospitals, where there should be available a specialized rigid containers for the transportation of mercury thermometers. Directly disposal doing most often private companies that have passed state accreditation. Often, however, legislation is not as effective as we would like. If contrary to regulations, to take the thermometer at the nearest health facility refuse to specify the address of the receiving point in the district administration. If the thermometer is damaged, it is necessary to urgently take emergency measures. The best solution would be to call the MOE, specialists in such challenges come quickly, carry out high-quality processing, which solves the problem. And it is not necessary to assume that a couple of mercury balls in a large apartment safe. Mercury is a poison, so MOE comes to such challenges, no questions asked. However, there are times when to solve a similar problem have their own. In this case, the main thing is not to panic, and to consistently perform all the necessary actions. First of all, you need to provide quality ventilation - open Windows and vents. Then assemble the pieces of a thermometer, don't forget to wear gloves. Visible drops of mercury pick up a rubber bulb or with a napkin dipped in oil. The collected drops and debris must be placed in a jar of water, cover tightly, at the first opportunity to take it in recycling. Place, which got mercury, it is necessary to process strong solution of chlorine or manganese. But what they should not do so is to collect droplets of mercury with a broom or vacuum cleaner, so you can only aggravate the situation. The thermometer is a very useful subject that requires careful handling, because it contains mercury – a hazardous metal. If the thermometer has broken or just inoperable, there is a need to get rid of it, but many do not know where to throw the thermometer. If a thermometer broke in the first place protect the place, which got mercury, as this metal has the property of spread in the apartment, for example, on the soles of shoes. Open the window, but be careful to avoid drafts, otherwise the mercury vapor spread quickly in the air. Then start collecting dangerous metal. Wear rubber gloves and cotton-gauze bandage. Mercury rolled into little balls, so it is most convenient to collect rubber bulb or syringe. If either hand does not, take a piece of tape or a wet sheet of heavy paper and slide it across the balls, they should stick. In a glass jar, prepare a concentrated solution of potassium permanganate and place the collected mercury and broken thermometer, tightly close the rubber cover. Call the emergency and report the incident. When you arrive the team of rescuers, pass them along with a jar of rubber gloves, cotton-gauze bandage and the subject was collected mercury. In addition, the responsibilities of the MOE includes the disinfection of the premises where it broke the thermometer. When disinfection is finished, then take care of your health. A weak solution of potassium permanganate rinse your mouth and throat, brush your teeth and take a few tablets of activated charcoal. Drink plenty of fluids, as mercury education are excreted through the kidneys. If the thermometer is intact, but inoperable, or simply not in use, is to take one of the special services. As a General rule, organizations implementing the medical equipment, containers for collection of mercury-containing and other hazardous waste. Call the helpdesk your locality and find out whether you have similar organization. If so, contact this organization and ask what day you can come and take a mercury thermometer. If not, please refer to the following paragraph. Unnecessary the thermometer can be taken at the station level or state pharmacy. These institutions are required by law to take mercury thermometers. All you need to do is come with a thermometer and write the application. If for any reason the specialists refuse to accept, then you should complain to the regional or city Department of health.